Could it really be true that this warm weather is here to stay? Everyone around here in Boston is giddy with excitement thinking that Groundhog was a good predictor of an early Spring. This time last year the grocery stores were being raided, Mila was 8 weeks old and our primary mode of transportation was a sled. So this beautiful weather has been a bit unexpected but oh so welcome. 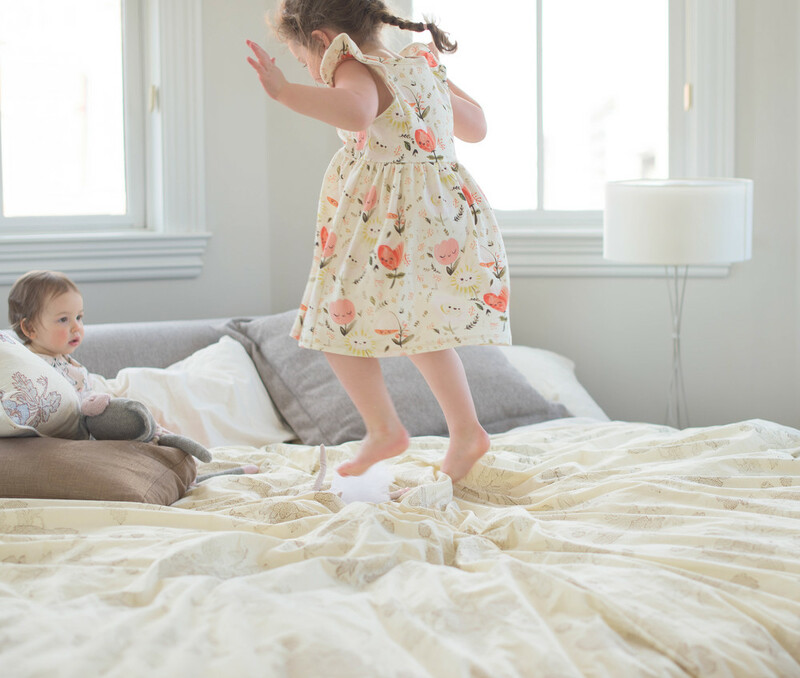 It also gave us good reason to pull out some of our newest warm weather pieces from the playful and modern children's line Vivie & Ash. 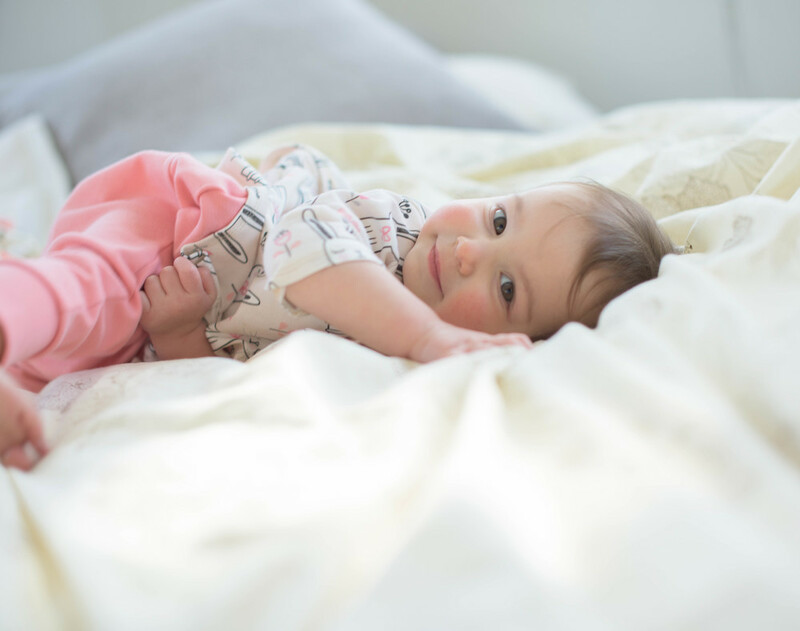 Since becoming a Mom, I've become more and more aware of the fabrics we put on our soft baby's skin and am always on the lookout for cleanly manufactured textiles like these 100% GOTS certified organic cotton pieces from Vivie & Ash. They feel wonderful against the skin, wash beautifully and give me the peace of mind I desire. What's more, they're beyond adorable! From bunny prints to pastel smiling flowers, it's near impossible to pick a favorite. Pictured is Elise in her special "butterfly dress," the Floral Dreams Flutter Sleeve Swing Dress and Mila in her Three Quarter Sleeve Bunny Peplum top and Light Coral Pocket Lounge Pants. No matter what the mood, our hearts are always happier when we have some tunes playing in the background. The girls start acting like their silly selves and dancing parties ensue. Their much loved dollies are wonderful companions both on and off the dance floor. To know Elise is to know she is in love with the Nutcracker. We had the wonderful opportunity to order a special Clara doll and Mouse King from the queen of embroidery, Sheremet Nadya from @familytoys. Take a peek at her page which is full of fairy take like embroidered creations. They are truly what dreams are made of. When we were expecting Miss Mila, I didn't purchase much, only a few special gifts for the new baby as we waited anxiously for her arrival. I had admired the wonderful knit creations from Fournier for years and knew that our second daughter would be welcomed home with a friend from the collection. A little girl bunny with a Parisian style and rosy cheeks was waiting to greet the newest member of our family.